Eight promising youngsters from Mackie Academy are currently in Malta taking on the rest of the world at badminton. The pupils travelled to Malta on Sunday to take part in the World Schools’ Badminton Championships which run from March 28-April 4. The pupils will be representing Scotland at the the International School Sports Federation World games. 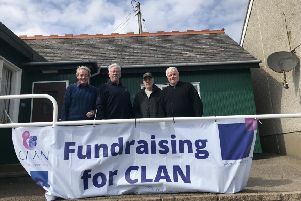 The team got some good news this week before they headed off thanks to a donation from the Stonehaven branch of Raeburn Christie Clark and Wallace. Prior to leraving they told the Leader: “The Mackie badminton teams heading to Malta this weekend to represent Scotland at the International School Sports Federation World games would like to offer a massive thank you to Raeburn Christie Clark and Wallace for their valued support in providing them with back packs and hooded tops which they will wear with pride throughout the event. The teams will face tough opposition in their group matches, the boys taking on Taipei, Portugal and Malta while the girls will face Turkey, Portugal, Slovakia and England. The Scotland team all from Mackie Academy is: Josh McKay, Sam Muir, Andrew McGillivray, James Hinchcliffe, Maria Leith, Anna McLeod, Katie Townsend and Colleen Duncan.